CreatureKind focuses on farmed animals because, in terms of both quantity and quality, the animals in our industrial farm animal production system are the most oppressed, abused, and disregarded animals in the world. But the vast majority of people in the U.S. are unaware of them, perhaps willfully so. Our legal system offers few protections to animals used for food. They are helpless, powerless, and voiceless, and they are God’s creatures—no different than the companion animals we love so dearly or the majestic wildlife before which we stand in awe. In the vastness of God’s creation, we are all creaturekind and, as Christians, it is our duty to acknowledge the plight of our fellow creatures, and to help them. Readers were stunned by the numerous accounts of cruelty at the Center: surgery and experimentation at the hands of untrained and unskilled staff; genetic and reproductive manipulations that resulted in wombs too large to birth properly, lethally low birth weights, deformations, and premature death; and other deaths caused by exposure to bad weather, treatable illnesses and infections, neglect, and starvation. In one study, thousands of newborn lambs perished in a program aimed at engineering domestic ewes who can give birth to and care for their young without human intervention—traits long ago bred out by humans. The research staff, testing “whether the mothers would respond to the young’s growing desperation,” watched as helpless lambs lain in a field, crying out for their mothers. [iii] Even after it became clear that the new mothers were not coming to the aid of their bleating offspring, the lambs were not retrieved and reunited with their mothers. [iv] Rather, they were left in the fields to die, succumbing to predators, weather, illness, and starvation. Perhaps the most shocking incident occurred during a bull sexual libido experiment, in which a young cow, an involuntary participant in the study, was raped to death. A typical way to test bull sexual libido would involve placing one cow with one bull for a fifteen-minute period; however, this particular experiment left the cow alone with six bulls over the course of several hours. With her head “locked in a cagelike device to keep her immobile,” the cow was defenseless as the bulls repeatedly mounted her, breaking her back legs in the process and leaving her body “torn up.”[v] She died within a few hours. What does this system look like in practice? A sow spends her entire life in a metal cage that is barely larger than the size of her body. It is so confining, she is unable to even turn around. She will face in one direction and be limited to the same few bodily positions with her flesh pressed tightly against metal bars and concrete floors for four painful years. She will never see sun, root in the grass, play with her offspring, or cool off in mud. She will only know the inside of a warehouse packed with thousands of other sows, saturated with the toxic fumes from the mountain of feces beneath the slatted floor, and permeated with illness and fear. She will be artificially inseminated repeatedly, only to have her offspring taken away or killed in front of her. When her body is spent, she will be released from the cage and killed for food. 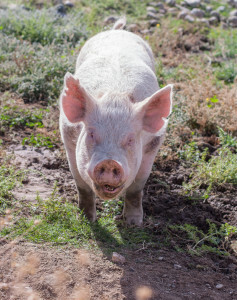 The sow’s life is not much different from that of a dairy cow, an egg-laying bird, a meat bird, beef and veal cattle, or any other factory farmed animal used for food. They are viewed and treated as machines that must produce more and more product in order to meet human demand; they are denied any dignity or enjoyment of life; and they are robbed of their natural proclivities. They are but a means to an end. But Surely Such Cruelty is Illegal? We would like to think that we live in a country that wouldn’t allow systemic cruelty—that it couldn’t possibly be legal to have such disregard for animal life, and that surely these examples are the extreme outliers in an otherwise regulated and respectable system. After all, we’re a country that loves animals: we spend roughly $60 billion dollars every year on our beloved companions! Currently, over 9 billion land animals are raised and slaughtered for food in the U.S. each year, with hundreds of millions more being raised and kept alive for eggs and dairy products. Long gone are the days of the bucolic pastoral farm: the vast majority of these creatures are born, live, and die in factory farming systems. For all of these billions of animals, not a single federal law exists to protect them during their lives, before they become food. Only two federal laws concerning farmed animals exist at all: the Humane Methods of Slaughter Act and the Twenty-Eight Hour Law. The former applies to how the animals must be killed and the latter to how they must be given food and water and allowed to rest after 28 hours if they are being transported. Neither of these laws applies to birds—chickens, turkeys, ducks, geese—who are omitted from these laws and all other laws pertaining to animals used for food (and who make up the majority of animals raised and killed!). The federal government has passed laws that protect the lives of other animals including wildlife, companion animals, and laboratory animals, but farmed animal protections have been left up to the states. In my home state of Texas, it is an offense to “torture a livestock animal,” with torture being defined as “any act that causes unjustifiable pain or suffering.”[xiv] However, exemptions are made if the torture is “a generally accepted and otherwise lawful … animal husbandry or agriculture practice involving livestock animals.”[xv] This is what is known as a common farming exemption, and most states have them. This exemption basically states that if a method or procedure is commonly practiced in animal agriculture then the method or procedure is considered legal. Think about this. There are laws in place in most states that make it illegal to inflict unjustifiable pain and suffering on an animal, unless it is pain and suffering that is widespread and inflicted on a large number of animals used for food. The legality of an act rests on whether it’s perpetrated on an individual animal or mass numbers of animals used for food. The common farming exemption allows for practices such as debeaking, dehorning, detoeing, tail docking and ear notching, as well as confinement in battery cages, gestation and farrowing crates, and veal crates. And don’t forget all the things we can do to “food production” animals in the name of scientific research (like the horrific practices of the U.S. Meat Animal Research Center). Industrial animal agriculture also tolerates less common practices that are flagrant abuses, like the cruelty captured by Mercy For Animals at a dairy farm in Wisconsin in the summer of 2014. [xvi] Andrus Dairy Farm employees were caught on film punching and kicking cows, spraying them in the face with high-pressure water hoses, cutting off their tails with pruning sheers, and dragging them by their necks using a rope and an SUV. After much publicity and an attempt by animal advocates to hold the abusers accountable, Assistant District Attorney Scott Niemi concluded that the wanton abuse caught on tape was not out of the ordinary and did not call for prosecution: “The actions of the employees caught on video do not amount to a situation where criminal charges are warranted based upon the review of local and state vets.” The legal system, industrial farming, and social convention exclude animals designated for food from the protections afforded other animals, as if farmed animals are not even animals. This is by no means solely a U.S. problem. Worldwide, over 70 billion land animals are used for food. The standard industry practices of debeaking, castration and the like are the same methods employed in other countries. [xvii] And the gratuitous abuse that happens in the U.S. happens elsewhere, too. This is a global epidemic fueled by a rapidly increasing and insatiable demand for animal products, coupled with a view of farmed animals as mere products to serve our desires, as livestock—living stock. With more countries adopting these views and emulating the factory farming system of the U.S., and with the growth of the world’s human population, cruelty will only become more common. CreatureKind So, why does CreatureKind focus on farmed animals? Because in terms of quantity and quality there are no creatures who suffer more on this planet and who are given less consideration by society and our legal system than farmed animals. As Matthew Scully so profoundly states in Dominion: The Power of Man, the Suffering of Animals, and the Call to Mercy: “Animals are more than ever a test of our character, of mankind’s capacity for empathy and for decent, honorable conduct and faithful stewardship. We are called to treat them with kindness, not because the have rights or power or some claim to equality, but in a sense because they don’t; because they all stand unequal and powerless before us.”[xviii] Farmed animals, particularly those in factory farms, have no power, no land, no voice. They are utterly helpless and entirely dependent upon our benevolence. It is our duty as Christians to embrace farmed animals, to show them empathy, and to speak up for them, even if we don’t understand them and can’t see ourselves in them. And the scriptures guide us. The prophets, conveying God’s word, spoke up and decried the maltreatment of the orphan, the widow, and the immigrant. The prophets challenged people to be aware of their plight, to consider how their actions and inactions contributed to their suffering, and to lift them up. To bring them closer to God. Jesus did the same on behalf of the social outcasts, the poor and the sick. It was radical to suggest embracing those who could so easily be ignored and left out, to go against the status quo, to risk one’s own comfort and inclusion in order to allow another to partake in the Kingdom. But the prophets and Jesus showed us that this response is the only acceptable response. Our faith calls us to live with this radical love. We are to constantly and earnestly ask ourselves who we’re leaving out and who we’ve overlooked, and then, even if we don’t fully understand why, we are called to love them and to lift them up. This is infinite, universal love—the same love that is bestowed upon us by our Creator. This love, given us so freely, is to be emitted by us to others. We cannot simply ignore their plight and look the other way by saying something like, But they’re just animals, any more than we could justify our actions by saying, But they’re just widows. God’s creatures need our help. We are called to help them. This is one of the many ways that we glorify God and honor God’s creation. The good news is that it’s quite easy to start helping farmed animals. We can research and learn more about animal agriculture and the unpleasant realities of the factory farming system. We can advocate for better laws and protections for these vulnerable creations. We can also ask our faith leaders and communities to consider farmed animals by including them in our worship services, our prayers, our hymns, and our ministries. And we can support farmed animal rescue and advocacy organizations. Most of all, we can remove ourselves from the industrial animal agriculture system and decrease our financial support of it by choosing plant-based foods. We can commit to learning new recipes, trying plant-based alternatives, and being open to living in a different, more loving way. Every day, with our words, our actions, and our bodies we can extend mercy and choose compassion, and stand up for the rights of the helpless. [i] Moss, Michael. “U.S. Research Lab Lets Livestock Suffer in Quest for Profit: Animal Welfare at Risk in Experiments for Meat Industry,” January 19, 2015. [iii] Moss, Michael. “U.S. Research Lab Lets Livestock Suffer in Quest for Profit: Animal Welfare at Risk in Experiments for Meat Industry,” January 19, 2015. [vi] A fifteen-member committee funded by a grant from the Pew Charitable Trusts to the Johns Hopkins Bloomberg School of Public Health. [vii] “Putting Meat on The Table: Industrial Farm Animal Production in America.” The Pew Commission on Industrial Farm Animal Production, 2008. [xi] For example, see Mercy For Animal’s undercover investigations at https://www.mercyforanimals.org/investigations.aspx; and The Humane Society of the United State’s investigations at: http://video.humanesociety.org/index.php?id=PLFF7DE1D5DD17F6CE&credit=web_id93480558. [xii] The Pew Commission on Industrial Farm Animal Production. “Putting Meat on The Table: Industrial Farm Animal Production in America,” 2008, 33. [xviii] Scully, Matthew. Dominion: The Power of Man, the Suffering of Animals, and the Call to Mercy. (New York, NY: St. Martin’s Press, 2002), xi.